The 30 Second Challenge Children's E-Books are split into three stages. Ideally children should have complete mastery of a stage before moving onto the next one, working through each book at least twice. Each e-book focuses on key areas of number and consists of many challenges. Children should work through these in order, noting answers on a separate sheet of paper so that the books can be reused. At the beginning of each e-book there is a whole page guide on how to use that volume. Parents and children should read this together. A record sheet is provided so children can monitor the time it took to complete the test and their overall scores. Teaching pages are also provided periodically with important tips. 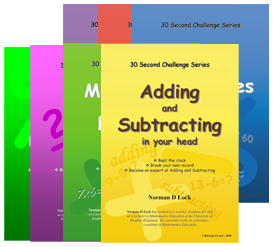 These e-books have helped tens of thousands of children to learn mathematics successfully. Good luck!